Common Name: Peucedanum root, Hogfennel root. Radix Peucedani is produced mainly in the provinces of Zhejiang, Hunan, and Sichuan. After the root is collected in winter and spring, the stem and the leaves are removed and the root is cleaned. Then it is dried in sunlight, sliced, and used unprepared. 1. Phlegm-heat accumulating in the lungs manifested as cough with yellow and thick sputum. 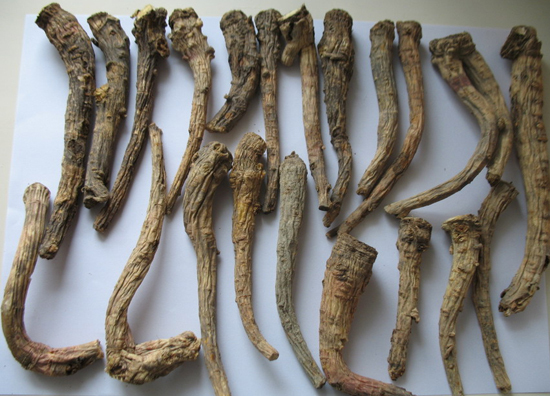 Peucedanum root (Qianhu) is used with Mulberry bark (Sangbaipi), Trichosanthes fruit (Gualou) and Tendrilled fritillary bulb (Chuanbeimu) in the formula Qianhu San. 2. Cough due to invasion by exogenous pathogenic wind and heat. 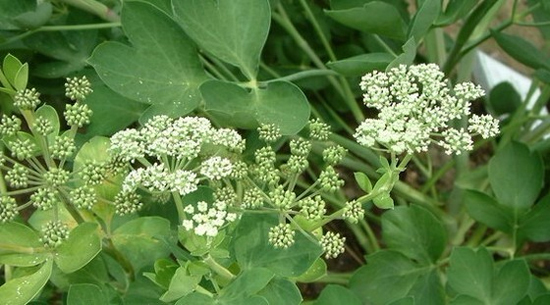 Peucedanum root (Qianhu) is used with Mentha (Bohe), Arctium fruit (Niubangzi) and Platycodon root (Jiegeng).